Several studies have directly or indirectly shown that at least some scorpion species abide by the venom optimization hypothesis both in sting and venom use. A scorpion's choice of weapon should reflect the level of threat (or the level of resistance of a prey). Andre Lira and co-workers have recently published an article showing that Tityus stigimurus (Thorell, 1876) (Buthidae) reacts differently depending on the level of threat. Higher threat level caused a more aggressive behavior and more use of the main venom (instead of the metabolic more "cheaper" prevenom). Venom demands high metabolic costs of the organisms that produce it because it is comprised of a complex mixture of various toxins. Due to this high cost, venomous animals modulate the amount or type of venom used depending on factors such as size of prey or intensity of predation threat. 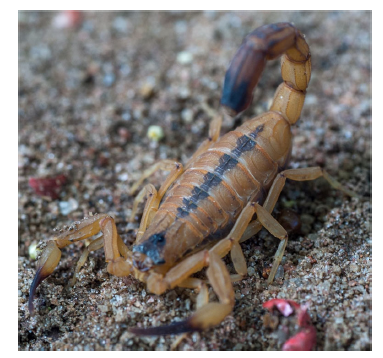 This paper shows that Tityus stigmurus, a prevalent scorpion species in the urban environment in the Northeast of Brazil, modulates its venom in response to different levels of stimuli. Sixty animals were collected in Vitória de Santo Antão, Pernambuco. The animals were subjected to either high or low levels of threats. During the tests, the animals were gently touched five times on the mesosoma with forceps at an interval of 5 s (high threat) or 5 min (low threat). The response varied significantly between intensity levels, with the animals exposed to low threat stinging in 70% of the observations and releasing a clear venom. In contrast, individuals subjected to a high level of threat stung in 83% of the observations and released a milky venom. Our results suggest that T. stigmurus reacts differently depending on the stimulus level. When the threat was considered high, the animal reacted more aggressively. Our results support the assumption that milky venom is only used when the animal is highly stressed because this venom represents higher metabolic costs than the production of clear venom. Thanks to Andre Lira for sending me this article!